Andrew "Andy" GREGORY was born on 29 May 1892 in Newport, Cocke, Tennessee. He died on 25 Jan 1975 in University Hospital, Oklahoma City, Oklahoma, Oklahoma. Andrew married Alpharetta Mae GREEN on 26 Oct 1913 in Near Marlow, Spephens, Oklahoma. Alpharetta Mae GREEN was born on 21 Oct 1895 in Marietta, Love, Oklahoma. She died on 24 Apr 1963 in Wynnewood, Garvin, Oklahoma. Alpharetta married Andrew "Andy" GREGORY on 26 Oct 1913 in Near Marlow, Spephens, Oklahoma. Dessie Lea GREGORY was born on 12 Mar 1915 in Family Farm Near Marlow, Stephens, Oklahoma. She died on 1 Feb 2003 in Pauls Valley, Garvin, Oklahoma. F ii Alpha Josephine GREGORY was born on 30 Dec 1917. She died on 23 Jun 2005. Alfred Andrew GREGORY was born on 5 Jul 1919 in Family Farm Near Marlow, Stephens, Oklahoma. He died on 9 Jul 1920 in Family Farm Near Marlow, Stephens, Oklahoma. F iv Lou Ila GREGORY was born on 29 Dec 1920. M v Everett Wayne GREGORY was born on 15 Aug 1923. He died on 13 Apr 2009. F vi Wanda June GREGORY was born on 20 Feb 1927. She died on 15 Feb 2013. F vii Gladys Loretta GREGORY was born on 22 Jul 1936. Lucien Grant WEBB [Parents] was born on 5 Apr 1916 in Fort Gay, Wayne, West Virginia. He died on 3 May 1988 in Oklahoma City, Oklahoma, Oklahoma. He was buried on 5 May 1988 in Green Hill Cem., Lindsay, Garvin, Oklahoma. Lucien married Mabel Effie HAYES on 6 Jun 1937 in Pauls Valley, Garvin, Oklahoma. Mabel Effie HAYES [Parents] was born on 21 Mar 1911 in Near Prague, Lincoln, Oklahoma. She died on 23 Sep 2002 in Shawnee, Pottawatomie, Oklahoma. 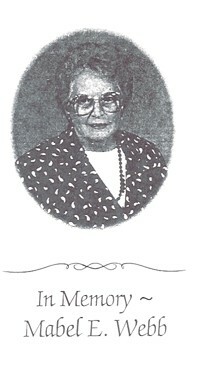 She was buried on 25 Sep 2002 in Green Hill Cemetery, Lindsay, Garvin, Oklahoma. Mabel married Lucien Grant WEBB on 6 Jun 1937 in Pauls Valley, Garvin, Oklahoma. M i Ronald Lucian WEBB Sr. was born on 28 Dec 1942. Clarence Walton ZINN [Parents] was born on 13 Sep 1906 in Fort Worth, Tarrant, Texas. He died on 4 Jan 1987 in Oklahoma City, Oklahoma, Oklahoma. He was buried on 6 Jan 1987 in Green Hill Cemetery, Lindsay, Oklahoma. Clarence married Amy Lena "Jo" HAYES on 7 Jul 1945 in Dallas, Dallas, Texas. Amy Lena "Jo" HAYES [Parents] was born on 12 May 1913 in Maysville, Garvin, Oklahoma. She died on 4 Jan 1987. Amy married Clarence Walton ZINN on 7 Jul 1945 in Dallas, Dallas, Texas. Clarence Lee ZINN. Clarence married Mertie WALTON. Mertie WALTON. Mertie married Clarence Lee ZINN. M i Clarence Walton ZINN was born on 13 Sep 1906. He died on 4 Jan 1987. 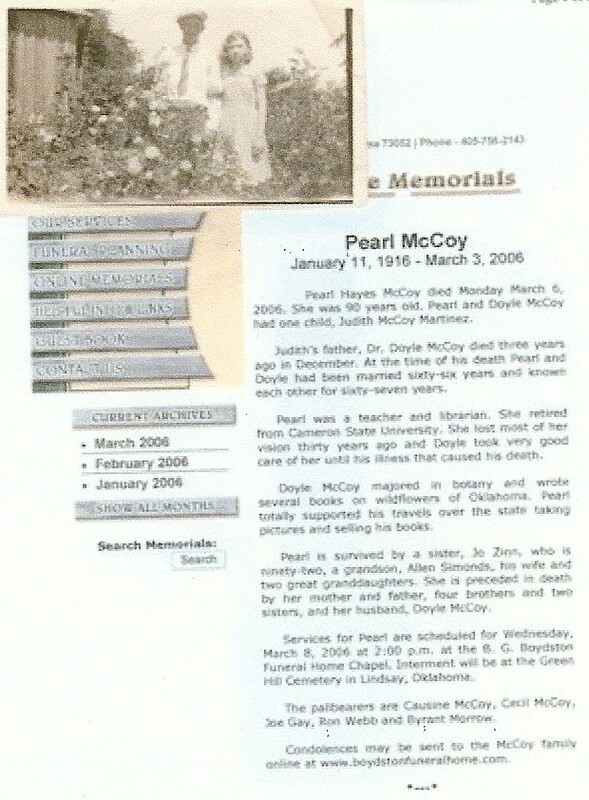 Dr. Doyle Allen MC COY [Parents] was born on 20 Feb 1917 in Alex, Grady, Oklahoma. He died on 11 Dec 2002 in Lindsay, Garvin, Oklahoma. He was buried on 14 Dec 2002 in Green Hill Cemetery, McClain, Oklahoma. Doyle married Iva Pearl HAYES on 30 Aug 1936. Iva Pearl HAYES [Parents] was born on 11 Jan 1916 in Maysville, Garvin, Oklahoma. She died on 3 Mar 2006 in Lindsay, Garvin, Oklahoma. She was buried on 8 Mar 2006 in Green Hill Cemetery, Lindsay, Garvin, Oklahoma. Iva married Dr. Doyle Allen MC COY on 30 Aug 1936. F i Judith Pearl MC COY was born on 30 Jun 1938. Antonio Salcedo MARTINEZ [Parents] was born on 14 Oct 1930 in Bluitt, Roosevelt, New Mexico. He died on 22 Oct 1994 in Oklahoma City, Oklahoma, Oklahoma. He was buried on 25 Oct 1994 in Green Hill Cemetery, Lindsay, Garvin, Oklahoma. Antonio married Iva Pearl HAYES. Iva Pearl HAYES [Parents] was born on 11 Jan 1916 in Maysville, Garvin, Oklahoma. She died on 3 Mar 2006 in Lindsay, Garvin, Oklahoma. She was buried on 8 Mar 2006 in Green Hill Cemetery, Lindsay, Garvin, Oklahoma. Iva married Antonio Salcedo MARTINEZ. Jose Antonio Montegro MARTINEZ was born in 1935 in San Antonio, Bexar, Texas. Jose married Iva Pearl HAYES on 12 Aug 1975 in Uvalde, Uvalde, Texas. Iva Pearl HAYES [Parents] was born on 11 Jan 1916 in Maysville, Garvin, Oklahoma. She died on 3 Mar 2006 in Lindsay, Garvin, Oklahoma. She was buried on 8 Mar 2006 in Green Hill Cemetery, Lindsay, Garvin, Oklahoma. Iva married Jose Antonio Montegro MARTINEZ on 12 Aug 1975 in Uvalde, Uvalde, Texas. TODD died about 1853. TODD married Mary E. TODD. Mary E. TODD [Parents] was born in 1827 in , , North Carolina. She died in 1861 in , Randolph, Arkansas. Mary married TODD. Sarah A. TODD was born in 1845 in , Randolph, Arkansas. Samuel Hargrave TALBURT was born in 1816 in , Union, Illinois. He died in 1865 in Arkansas City, Arkansas, Arkansas. Samuel married Margaret about 1846. Margaret was born about 1826 in , , Iowa. She died in 1861. Margaret married Samuel Hargrave TALBURT about 1846. M i Jacob Wilson "Jake" TALBURT was born on 3 Jan 1849. He died in 1922. SHORE. SHORE married Myrtle Jewel TALBURT. Myrtle Jewel TALBURT [Parents] was born on 30 Jan 1887 in Arkansas City, Arkansas, Arkansas. She died on 5 Dec 1980. Myrtle married SHORE.